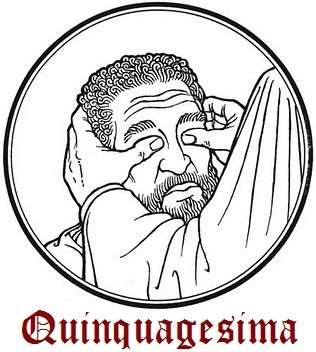 Quinquagesima is the name used in the Western Church for the Sunday before Ash Wednesday. It was also called Quinquagesima Sunday, Quinquagesimae, Estomihi, or Shrove Sunday. The name Quinquagesima originates from Latin quinquagesimus (fiftieth), referring to the fifty days before Easter Day using inclusive counting which counts both Sundays (normal counting would count only one of these). Since the forty days of the Lenten fast does not include Sundays, the first day of Lent, Ash Wednesday, succeeds Quinquagesima Sunday by only three days. The name Estomihi is derived from the beginning of the Introit for the Sunday, Esto mihi in Deum protectorem, et in locum refugii, ut salvum me facias. In today’s epistle St. Paul speaks of the necessity, the excellence and the nature of true charity. He says that all natural and supernatural gifts, all good works, even martyrdom, cannot save us if we have not charity; because love alone can render our works pleasing to God. Without charity, therefore, though ever so many prayers be recited, fasts observed , and good deeds performed, nothing will be acceptable to God, or merit eternal life. Strive then, O Christian soul, to lead a pious life in love, and to remain always in the state of grace. Be my rock of refuge, O God, a stronghold to give me safety. You are my rock and my fortress; for Your name’s sake You will lead and guide me. Ps 30:2 In You, O Lord, I take refuge; let me never be put to shame. In Your justice rescue me and deliver me. V. Glory be to the Father, and to the Son, and to the Holy Ghost. R. As it was in the beginning, is now, and ever shall be, world without end. Amen. Be my rock of refuge, O God, a stronghold to give me safety. You are my rock and my fortress; for Your name’s sake You will lead and guide me. Lesson from the first letter of St Paul the Apostle to the Corinthians: Brethren: If I should speak with the tongues of men and of angels, but do not have charity, I have become as sounding brass or a tinkling cymbal. And if I have prophecy and know all mysteries and all knowledge, and if I have all faith so as to remove mountains, yet do not have charity, I am nothing. And if I distribute all my goods to feed the poor, and if I deliver my body to be burned, yet do not have charity, it profits me nothing. Charity is patient, is kind; charity does not envy, is not pretentious, is not puffed up, is not ambitious, is not self-seeking, is not provoked; thinks no evil, does not rejoice over wickedness, but rejoices with the truth; bears with all things, believes all things, hopes all things, endures all things. Charity never fails, whereas prophecies will disappear, and tongues will cease, and knowledge will be destroyed. For we know in part and we prophesy in part; but when that which is perfect has come, that which is imperfect will be done away with. When I was a child, I spoke as a child, I felt as a child, I thought as a child. Now that I have become a man, I have put away the things of a child. We see now through a mirror in an obscure manner, but then face to face. Now I know in part, but then I shall know even as I have been known. So there abide faith, hope and charity, these three; but the greatest of these is charity. You are the God Who alone works wonders; among the peoples You have made known Your power. V. With Your strong arm You delivered Your people, the sons of Israel and Joseph. Sing joyfully to God, all you lands; serve the Lord with gladness. V. Come before Him with joyful song; know that the Lord is God. V. He made us, His we are; His people, the flock He tends. At that time, Jesus taking to Himself the Twelve said to them, Behold, we are going up to Jerusalem, and all things that have been written by the prophets concerning the Son of Man will be accomplished. For He will be delivered to the Gentiles, and will be mocked and scourged and spit upon; and after they have scourged Him, they will put Him to death; and on the third day He will rise again. And they understood none of these things and this saying was hidden from them, neither did they get to know the things that were being said. Now it came to pass as He drew near to Jericho, that a certain blind man was sitting by the wayside, begging; but hearing a crowd passing by, he inquired what this might be. And they told him that Jesus of Nazareth was passing by. And he cried out, saying, Jesus, Son of David, have mercy on me! And they who went in front angrily tried to silence him. But he cried out all the louder, Son of David, have mercy on me! Then Jesus stopped and commanded that he should be brought to Him. And when he drew near, He asked him, saying, What would you have Me do for you? And he said, Lord, that I may see. And Jesus said to him, Receive your sight, your faith has saved you. And at once he received his sight, and followed Him, glorifying God. And all the people upon seeing it gave praise to God. Blessed are You, O Lord; teach me Your statutes. With my lips I declare all the ordinances of Your mouth. May these offerings, O Lord, we beseech You, wash away our sins; may it sanctify the bodies and souls of Your servants for the celebration of this sacrifice. Through our Lord Jesus Christ Thy Son. Who liveth and reigneth with Thee in the unity of the Holy Ghost, one God. Forever and ever. R.Amen. They ate and were wholly surfeited; the Lord had brought them what they craved: they were not defrauded of that which they craved. We beseech You, almighty God, that we who have received the Bread of heaven, may by it be protected from all adversity. Through our Lord Jesus Christ, Who livest and reignest, with God the Father, in the unity of the Holy Ghost, one God For ever and ever. R. Amen.